According to the Birmingham Mail, 5-foot eel weight thought to be about 20-years-old was recently discovered in a waterway in West Bromwich, UK after it is believed to have made the 3,500 mile trip from Bermuda. The story said, ”A rare eel has been discovered in a waterway in West Bromwich – after swimming 3,500 miles from Bermuda. The five-foot eel – thought to be two decades old – was found in a canal after the water was scoured during a pollution incident. “It is believed the slippery creature may have swum thousands of miles from the tropical paradise of Bermuda to make its home in the Black Country. 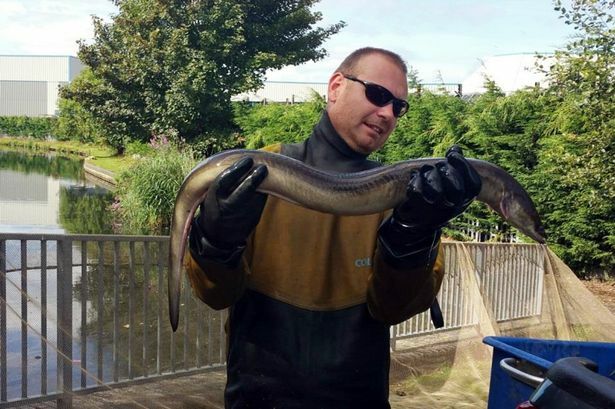 “The 5lb 10oz eel was discovered by workers from the Canal & River Trust charity, after nearly 200lbs of fish were rescued from the Ridgacre Branch Canal, near Carters Green.